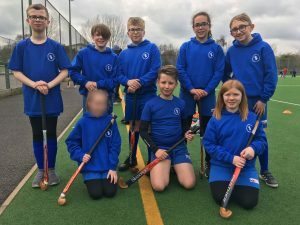 A team of 8 made up of 5 boys and 3 girls travelled to Aldersley Leisure Village to play in the annual Wolverhampton Primary Schools In2Hockey Tournament Heats. Led by Captain Ray the team lost their first game against St Barts B 4-0, followed by close defeat 1-0 against Bilston A. The final game saw us come away with a 1-0 win with Ray getting our first and the only goal of the game. The whole team progressed and improved with each game and were unlucky to only win one of their matches. The finals are next Wednesday. Well done, I was very proud of you all. Mr Morgan.